We love kids attending our rodeo, and have several activities to entertain kids and their families. The activities take place in the rodeo arena, and give the kids an opportunity to see what the arena looks like from the participant’s point of view. 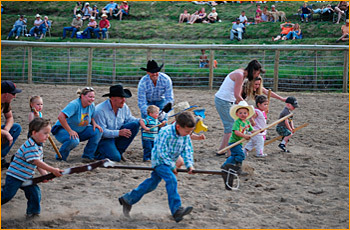 There are two age groups for the stick horse race, 3 years old and under, and 4 to 6 years old. We provide stick horses, or you can bring your own if you would like! The winner in each age group receives a real cowboy belt buckle, provided by the Methow Valley Horsemen. All other participants will receive a ribbon. 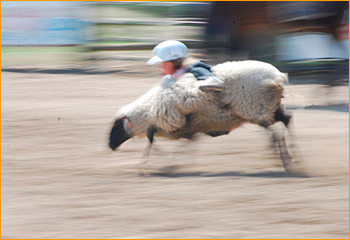 Ride a sheep! A Rodeo favorite for the little kids, five years old and under, and not over sixty pounds in weight. Contestants must register at the office and obtain a ticket to present at the bucking chute. Saturday event riders may not ride again sunday unless all sunday participants have ridden.